Rock On The Range--part of the World’s Loudest Month festival series--celebrates its ninth year in 2015 with a stellar lineup of top rock bands led by multiplatinum artists LINKIN PARK, global rock juggernauts SLIPKNOT and heavy metal legends JUDAS PRIEST--who are currently celebrating their 40th Anniversary. The festival also features the Rolling Rock Comedy Tent, an interactive graffiti art installation by RISK and a full vendor village. For full festival details, visit www.RockOnTheRange.com. Those who have not purchased tickets can tune in to live music’s top cable channel, AXS TV--the official ROTR broadcast partner--to see various performances and band interviews throughout the festival weekend. 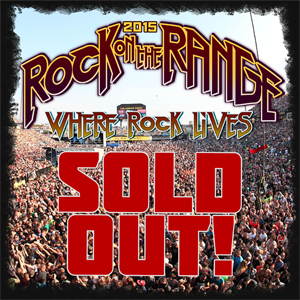 Rock On The Range is produced by Danny Wimmer Presents, AEG Live, MAPFRE Stadium (formerly Crew Stadium), and RockHouse Presents. The nationally renowned festival that’s centrally located in the heart of the country is proud to be part of the World’s Loudest Month festival series, and annually draws huge weekend crowds since its inception in 2007.